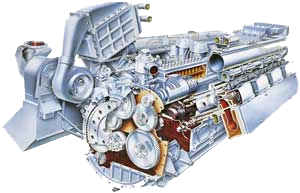 Water-cooled four-stroke 6- and 8-cylinder in-line engines and 12- and 16-cylinder 120º V-engines. Charge air cooling optional on all engines. High operation reliability due to a simple engine construction and moderate piston speed.